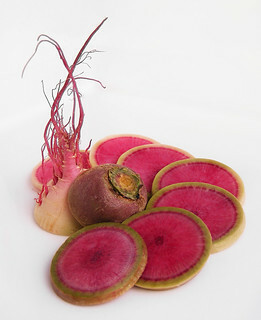 Watermelon radish, Japanese radish, Chinese radish, watermelon daikon, Asian red meat radish, beauty heart radish, roseheart radish, misato rose radish, Raphanus sativus L. ‘Red Meat’, shinrimei / xīnlǐ měi luóbo / 心里美 (China). This originally Chinese radish (strangly enough often called “Japanese radish”) is bigger than the radish we know in the West, sometimes much bigger. The literal translation of the Chinese name is “beautiful heart”, because while the outside looks like a boring white turnip (“dipped upside down” in green or purple) the inside is a sensationally fuchsia red and looks like a watermelon. The taste and texture of a watermelon radish is more like daikon than radish. Mildly peppery with a firm bite, but less watery than a radish. It tastes really nice! Just cut the radish in slices, strips, cubes, discs, julienne, brunoise or when you have one of those gadget-machines in spaghetti like strips. You can braise or grill them, then the taste and colour will mellow down a bit. Also nice in salads, just raw. Perfect for pickling with a little rice vinegar, sugar and salt. You can use them in any recipe that calls for radish or daikon. Keep refridgerated. Not that difficult to grow yourself if you can find the seeds. Can be a cool substitute for the meat in steak tartare. Serve with capers, mayo, etc. Tianjin preserved vegetable, Tianjin preserved cabbage, Tientsin preserved vegetable, Tianjin winter vegetable, Tiānjīn dōngcài / 天津冬菜 (China), tang chai (Thailand). Tianjin preserved vegetable is made with a thinner, more slender kind of napa cabbage from the Tianjin region called Tianjin cabbage / 天津白菜. The cabbages are first sundried, then chopped into thin strips, rubbed with salt and usually some garlic too and put in earthenware pots to ferment. It tastes a bit like sauerkraut only much more intense. And it tastes strongly of garlic too. 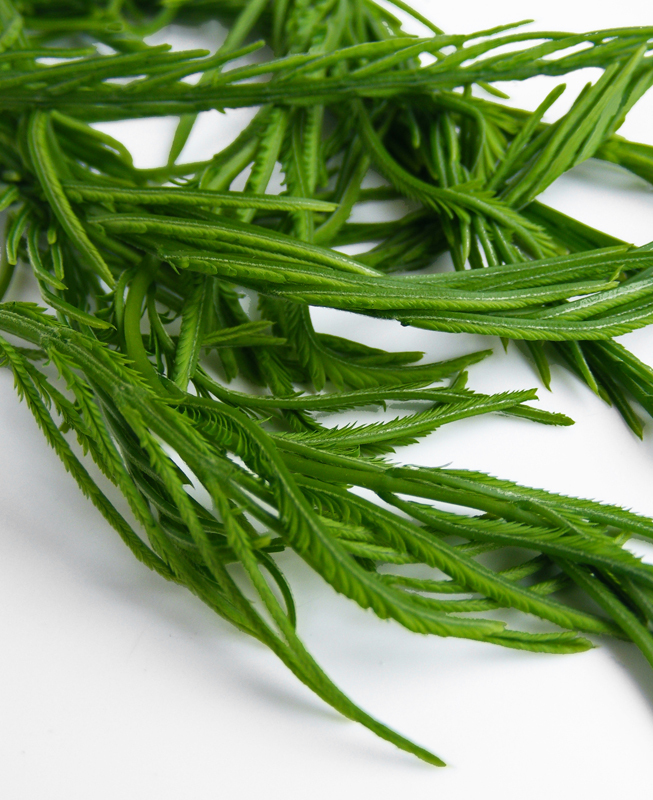 Chop finely and use a little bit of it in soups, stir fries and stews. It is rather salty so it’s a good idea to rinse it first. 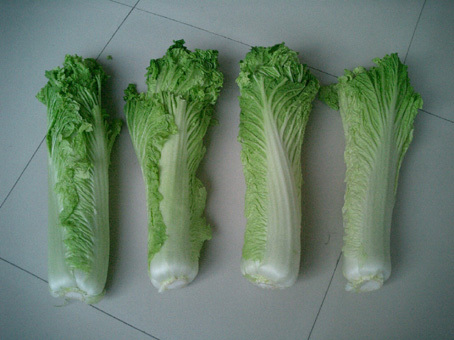 Tianjin preserved vegetable is normally used in small quantities. To prevent your dish getting too salty, wait with seasoning it with salt or soy sauce until after you’ve added the Tianjin preserved vegetables. Often sold in typical, brown earthenware jars like in the photo above that you can keep in your cupboard almost indefinitely. 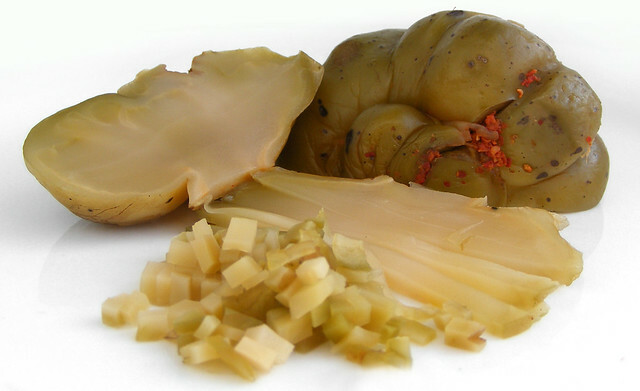 Sichuan preserved vegetable, Szechwan vegetable, Chinese pickled vegetable, pickled mustard tuber, zha cai / zhàcài / 榨菜 (China). Also: tsa tsai / jar choy / jar choi / ja choi / ja choy / cha tsoi. The pickled, rather strange looking stem of a special kind of mustard cabbage from Sichuan, the Brassica juncea var. tsatsai (see photo). 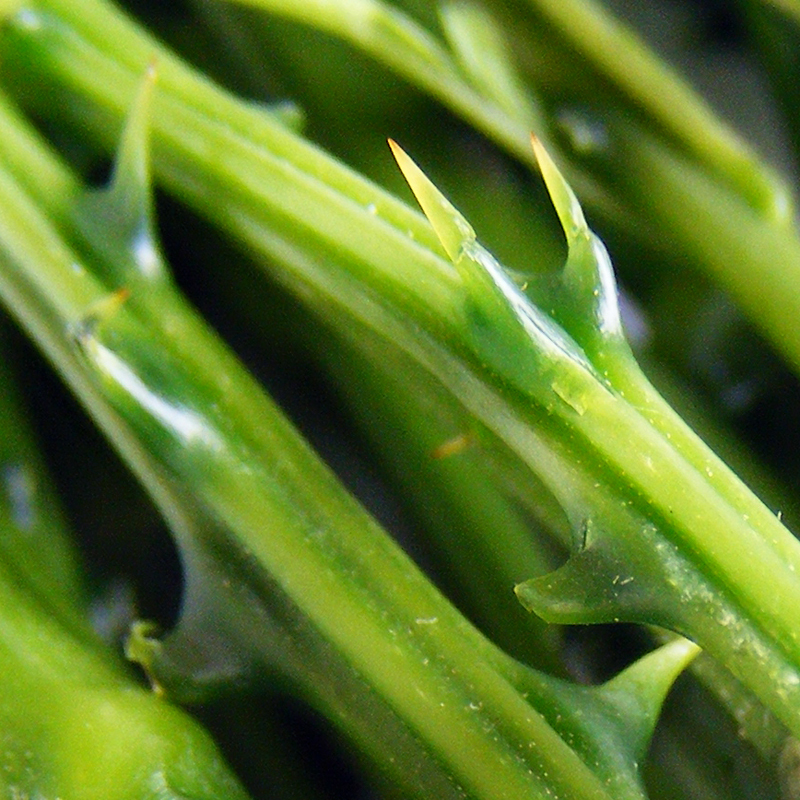 These fist-sized bulby stems are rubbed with plenty of salt, then pressed with weights to slowly release its moisture. Then they are dried, rubbed with red, hot chili paste and left to ferment in big earthenware jars. This process is pretty similar to the way Koreans make kimchi and the taste and texture is a bit like our pickled cucumber. 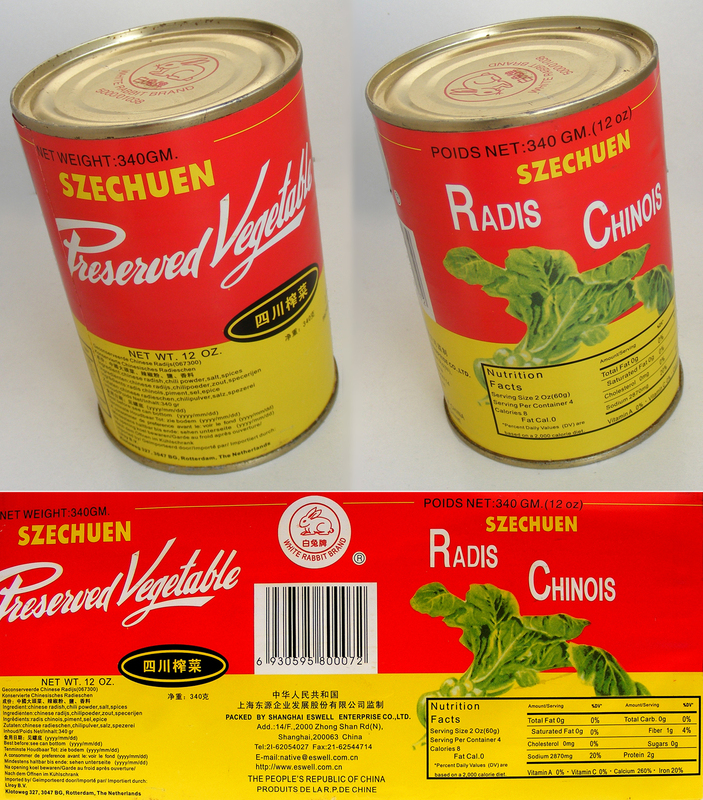 You usually find Zha Cai in tins. 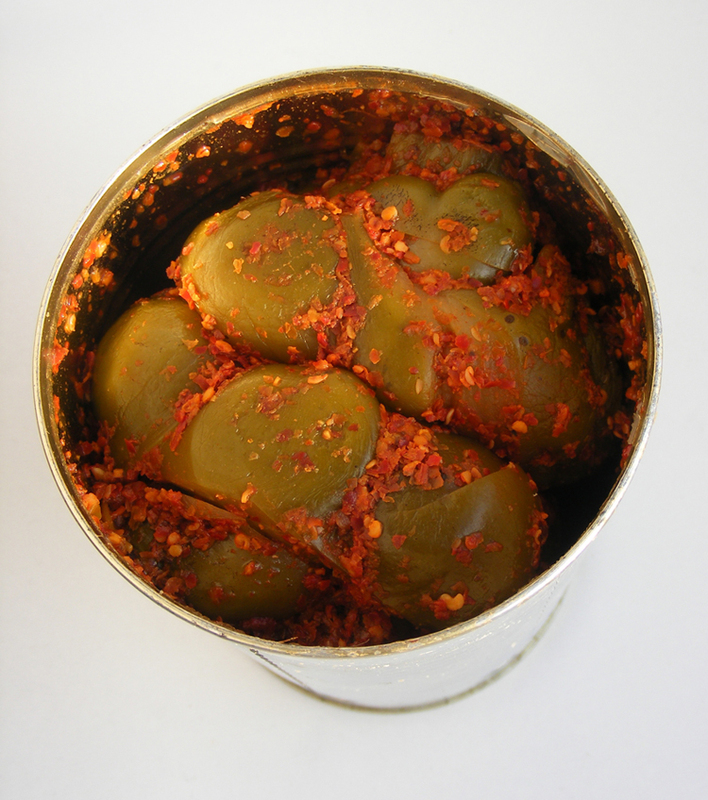 Open the tin, then cut off the piece you need, rinse off the chili paste, de-salt it by soaking it for about half an hour in a cup of water, vinegar or white wine. Then cut it into small strips or cubes and use in all kind of dishes. You can braise, cook, stir-fry or even eat it raw, as a pickle. Zha cai bought in bags usually is already cut into strips for you. Never keep leftovers in the tin, transfer to a small container or plastic bag and keep refrigerated. It will keep for months if not years. Ya cai / 芽菜, suimi ya cai, preserved mustard greens from Sichuan, Sichuan pickled mustard cabbage. 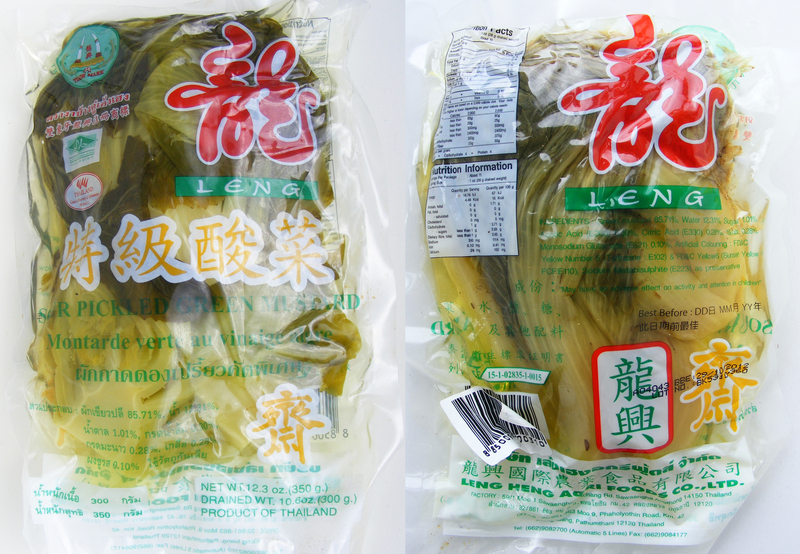 The pickled leaves of a mustard plant variety “guang gan qing cai”, only known/grown in Sichuan. The leaves, which are first rubbed with salt and sundried are layered in stoneware pots, together with sugar and maybe some chilli pepper and left to ferment for months. Ya cai is one of the basic tastes of Sichuan cuisine. Ya cai is very difficult to find in the West, the most famous brand (Suimi) is sold in little, convenient bags . It’s probably best to rinse it under the tap to get rid of the excess salt. Then squeeze it to get rid of the water. You can shortly stir fry it in some oil to make it semi-crunchy and use as a garnish. You can also add it to the garlic and ginger when making a stir fry. 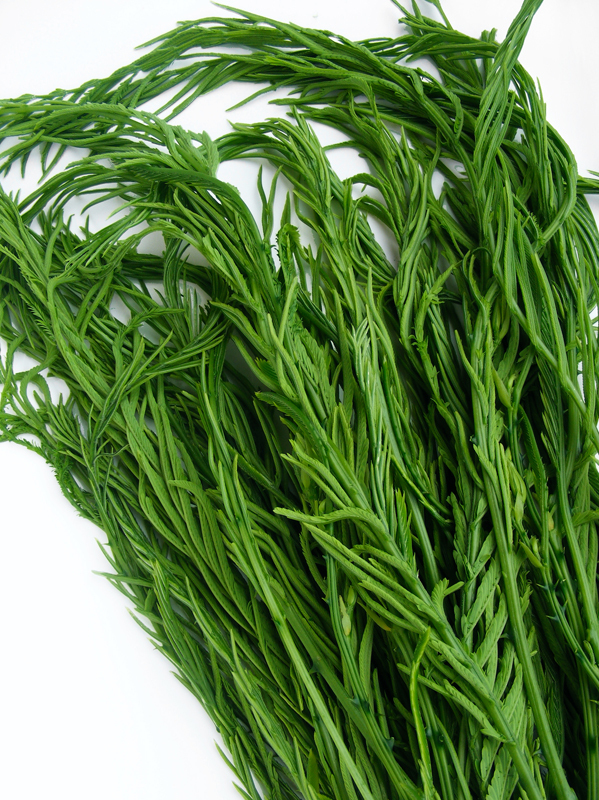 Ya cai is used in some of the most famous Sichuan dishes like Dan Dan Noodles or stirfried green beans. Chinese sauerkraut, Chinese kimchi, pickled Mustard Greens, dưa chua (Vietnam), swan tsai / suān cài / 酸菜 (literally: sour vegetablesn) or xián cài / 鹹菜 (literally: salted vegetables) (China). 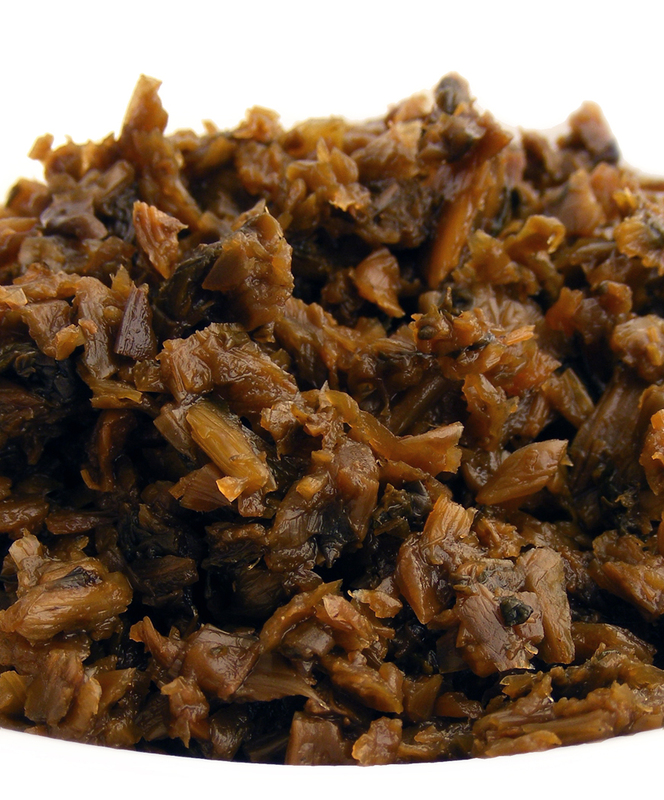 Suan cai probably is the very first version of sauerkraut; cabbage is shortly blanched in boiling water, then sundried, sprinkled with plenty of salt, transferred to big earthenware jars and topped with weights that will slowly press out all moisture during fermentation. In the North of China they use napa cabbage (sometimes even plain, white cabbage, like in sauerkraut), in the South of China they use the less familiar jie cai (Chinese mustard cabbage). 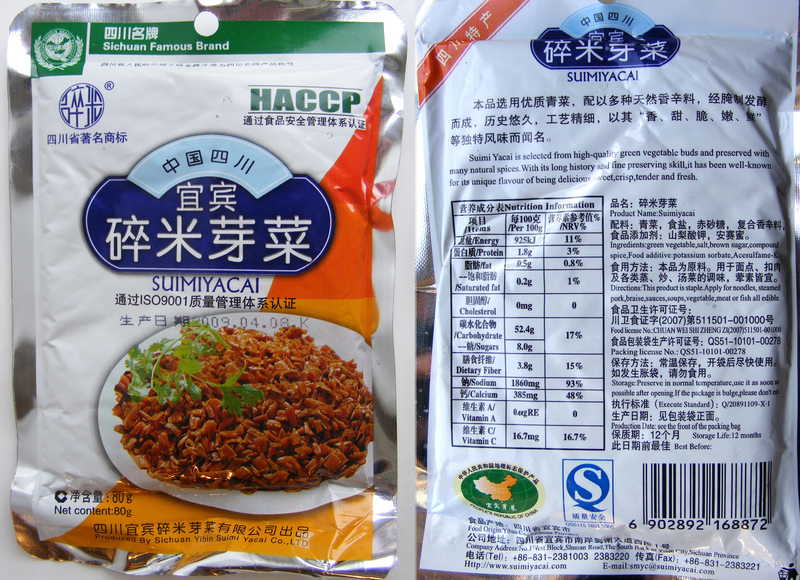 Similar to sauerkraut, suan cai tastes sour, not salty as you might expect. Often sold in plastic bags. Rinse the suan cai under the tap, then leave it for a while in some water (with a dash of vinegar) to get rid of most of the excess salt. Use some chopped suan cai as topping on beef noodle soup, to flavor the filling of jiaozi, incorporate it in stir fries or simply serve it as a little side dish. It’s the suan cai that gives the typically sour edge to the broth for Northern Chinese style hotpot. Suan cai goes well with greasy pork or fish. Sealed in its bag you can keep it for months, if not years. Once opened you can still keep it quite some time, but best refrigerated. Vegetarian recipe: tofu stir-fry with suan cai. Don’t confuse with zha cai or ya cai, also “pickled mustard cabbage “, but from a different variety and from Sichuan. 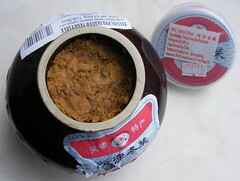 Or Tianjin dong cai, pickled napa cabbage from Tianjin.